Swamp Suburbia: As Big as a House! There are two donkeys that live here with our horses. They arrived here shortly before Christmas. They were bought for protection. We wanted them to be our horse guards. As, many of you may know, donkeys do not like dogs. No dogs of any kind. Mr. Cowboy warned me that I needed to watch my dogs to make sure the donkeys did not chase them, because the donkeys can not tell the difference between a domestic dog and a coyote. I chuckled. He is so cute!! But soon after the two donkeys arrived we all noticed something strange about them. Mr. Cowboy says it best, "They are broke!!" That's right. We got broke donkeys. They actually let my in-law's German Shepherd bite and pull their tales. Also, they let three coyotes run right past them and they didn't even lift their heads up from eating. Yep, I would have to agree that these there donkeys are just plumb broke. 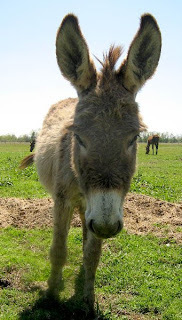 But oh, who cares if we have coyotes and other domestic dogs chasing our horses, these donkeys are just too cute!! We have other means to take care of the dog issue. Let me introduce you to Molly. 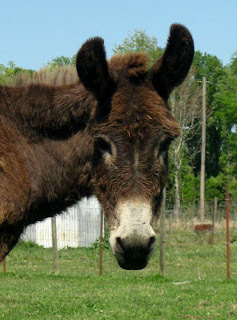 She is the older donkey. She is brown and oh so sweet. My cowpokes can do whatever they want to her. And I so love her big ears. Her name is Molly. She is just the sweetest donkey ever. The kids just climb all over her and she doesn't move. And another interesting fact about Molly is that she is expecting. 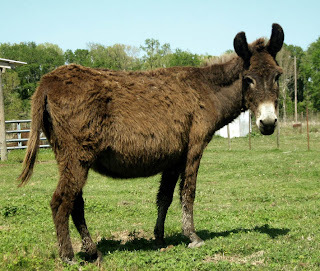 She is due to have a little baby donkey any day now. Let me show you her good side. Isn't she so beautiful. Well, kinda. Okay she is darn right funny looking, but she is such a good girl. That picture just doesn't do her belly justice. Look! There she is! And I think she has that pregnant glow about her. It's sad to say that this photo was taken about a month ago and she still hasn't had her baby and that belly has just gotten bigger. I am really excited for a baby donkey. I want to see it's little fuzzy body, and long ears, and its short legs. Oh, I just can't wait. Molly is not the only donkey here. She came with a little one year old donkey named Misty. She comes from a long line of ancient oriental donkeys. See. She is a rare descendant that was shipped accidentally to the US from the most eastern part of China. Or, she could just be squinting to see me. It was really sunny that day. Okay, she is really just a normal donkey. Nothing special. But this is the closest I have gotten to her. She was curious about my camera. She came really close. The kids have started feeding her treats to get her to come closer. She is still a baby. Those are the two resident donkeys. They are spoiled rotten and fed way too much, and I think they love it. I have some really good upcoming news!! I am so excited about it!! I will post about it later. But until then, y'all come back now ya hear! Are you guys starting a zoo? Horses, donkeys, dogs, kids peeing in the yard. All you need now is that goat! We just got a Donkey last week for the same reason...he's broke too. Now we have a mean nasty 'mule' but I really think he's a heiny (sp?) 'cause he's ugly as hell. I want a baby donkey. Their ears are as long as their legs! 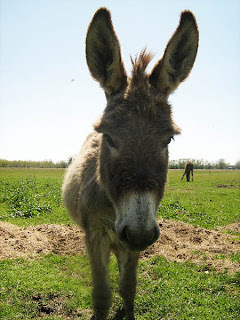 I love donkeys! Those and goats are the two animals that I'd love to add to our collection. The problem is getting Sam talked into them. 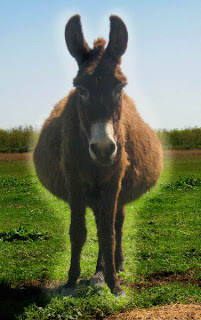 I love your donkeies!!!! I want one! ship me a baby donkey for toby to play with! AAAAHHHHHHHHHHH! I am in LOVE! I was totally buying it about rare Oriental donkeys--I'm such a city girl!